Oh, hey. Happy Wednesday, everybody! This week's comic is about what happens when you realize that, at the end of the day, you actually hate everything you just made. We made two comics this week. One's currently on the front page, and the other one is dead. We murdered it. Thoroughly. At about 5:30 yesterday evening. So there's that. It was a comic about a game we love and a show we adore. The art came out great. So, why did we kill the 9 panel project we've been slaving over? That we scripted in August? That we were genuinely proud of at first? Because we couldn't shake the feeling that some things are just not joke-able. We looked at each other and acknowledged that putting Killer Bob in a weekly gag strip is not the best idea. Twin Peaks is a wonderful show, and often even a funny show, but you can't reference that particular show without the reminder of the violence churning underneath the wholesome nostalgia. And that's the whole point. All kinds of horrific things happen in Twin Peaks, especially in the places our characters feel the most safe. I think this speaks honestly about a lot of us. If we can just ignore the darkness down the street or out the window or in the next room, we can keep feeling good about the place we grew up, right? Twin Peaks centers around the death of a girl named Laura Palmer. She had a violent, abusive home life, but everyone in town thought the Palmers were perfect, especially Laura. She was the homecoming queen. She was dating the quarterback. She worked the local meals on wheels route. Everyone was too in love with the idea of her to see that Laura was actually begging them all for help. It took an outsider like Agent Dale Cooper, and even an outsider from another dimension (The Giant/Fireman), to begin to pull back the layers of willful ignorance to find Laura Palmer's killer. In fact, in episode 3 of the show, Cooper has a dream where the truth of Laura's death is revealed to him in part by a character literally named "the man from another place". See that? This just turned into a Twin Peaks blog. That's probably why we wanted to make the comic in the first place. The show is infinitely quotable, memorable, and original with characters that are the forebears of most of your favorite TV protagonists. 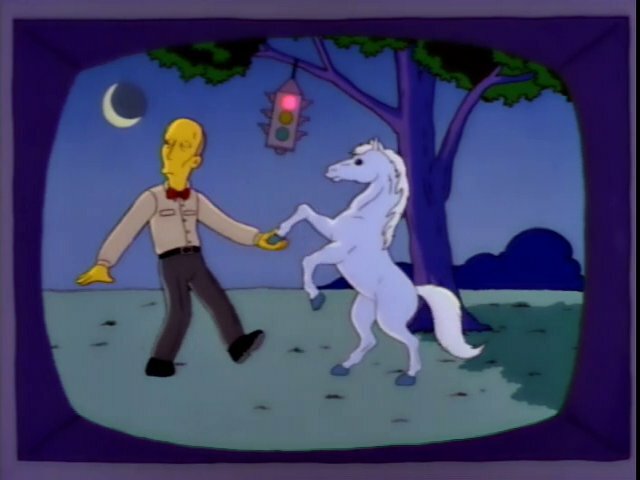 The Simpsons made a few great Twin Peaks jokes, usually about the surreal absurdity in Cooper's dreams. The horse is the white of the eyes? I dunno. Nobody knows. But a character like Bob is never a joke. He's a monster and a critique on the monstrousness of the people that turn a blind eye. We don't want to be those people. That's our story. We decided that this week's strip should be a chronicling of our journey from yesterday evening. With that, I think it's time to go to sleep. It feels like we've been awake for 25 years.